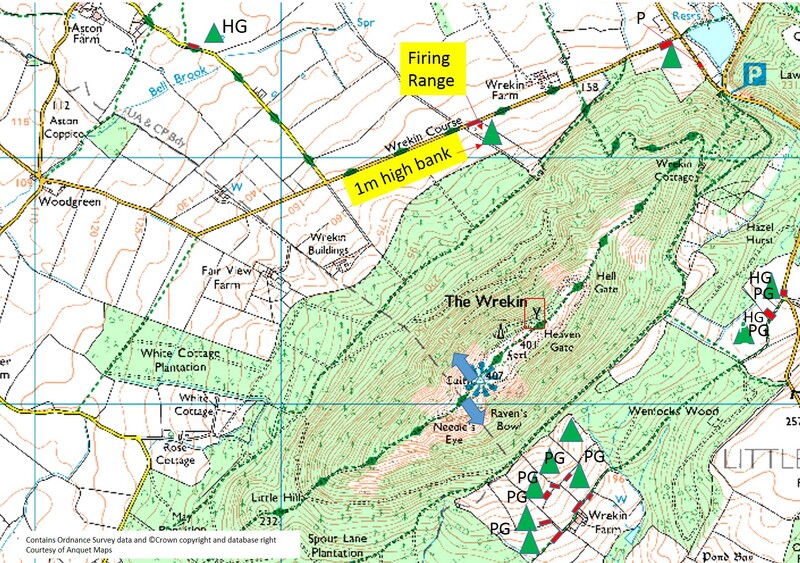 The Wrekin (NW) is currently open to LMSC members only (temporary guest membership can be obtained by contacting any committee member). M54 junction 7, turn South. At 0.8 miles, close to a ‘T’ junction, the access track climbs off to the right. Parking is on the public roads around the track entrance. However, it is ok to take a 4×4 vehicle up to the entrance to the TV mast, drop your kit off, and return the vehicle to the Halfway House and park the said vehicle on the left hand side of the gate (looking up the Wrekin). Note that the Halfway House is the ONLY place where we have permission to leave a vehicle on the hill. 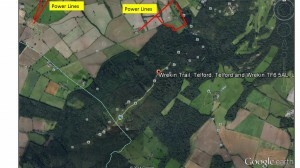 The Wrekin is a popular walking spot for the public and can be busy, please respect this and launch and fly sensibly. Take care not to be dragged back into the path of spectators and do not attempt to top land if people are in the way. Take-off: NW – Take off from the ‘lip’ in strong conditions. Trees to the right of launch can play a major part in giving a false wind direction. Top landing: not advisable. Note the NW rotor marked on the map. SE, HG: Watch for power lines and trees. There is significant airspace (MATZs/ATZs) close to the Wrekin, downwind of the SE side. Check your airspace map carefully before going XC. The NW PG bottom landing options cannot be seen from launch. In some conditions, especially if the wind has some North in it, it might not be possible to make the official fields. Be especially careful not to be caught out and land in the trees. If in doubt, head out! 1) The field further to the right of the rifle range (i.e. not adjacent) as indicated on the map can be used, but ONLY if there are no horses in it. Please check before flying. This field has a power line within it. 2) The Firing Range which is currently inactive. This field is narrow and has one metre high banks across it which can be obscured if the grass is long. NB: the banks have deep holes at regular intervals into which the riflemen would lower themselves, take care to avoid these holes (and banks) when landing and when walking over the field. 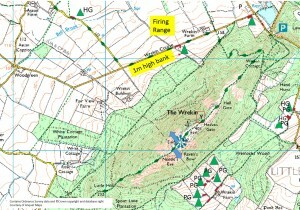 There is one official NW HG field (see the map above) – please do not use if the field is ploughed and beware of the power line. Neil Roberts, 30.08.2003, 168.1km to Vernham Dean. PG. Fields not marked ‘HG’ slope steeply. An up-slope/down wind landing is the only practical method for HG in an emergency. Pilots must be current LMSC members. Pilots must be licensed and insured members of the BHPA. All members shall observe the Countryside Code, in particular in relation to property and livestock. No livestock are to be frightened or stampeded by fliers. Any damage to be reported to the Estate Office (Tel 01743 232477) immediately. Farmers will be compensated for damage to crops or livestock, plus costs, if appropriate.